sandpaper and silly putty: what's cooking carson? I'm back with more about Carson's new kitchen. I'm thrilled to report that he still finds it VERY entertaining. He's been cooking up all sorts of good stuff (love that watermelon and bread stew). In my previous post I gave you a peek at what I "renovated" on his little Ikea kitchen and here I'll start to go into the details. I'll start with his "new appliances". I painted the stove and microwave to look like stainless steel. The goal was to make it look like the real thing. I used Rustoleum Primer, followed by Rustoleum metallic spray paint for the microwave and oven. I taped off the glass on both sides, gave it a quick sanding with 200 grit sand paper, and gave it a few coats. I sealed it with clear enamel to keep it from scratching. I painted a black rim on the glass with a paint brush and some black epoxy appliance paint we had in the garage. I swapped out the handles for some satin nickel drawer pulls from Lowes. Any 5" drawer pulls will fit perfectly. 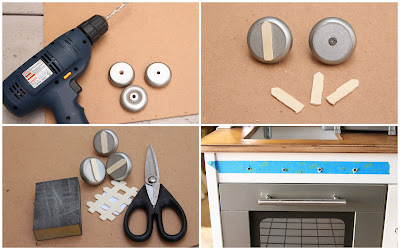 I added oven knobs using some $0.99 knobs and a $0.29 wooden picket fence piece that I found at Michaels. I cut the picket fence to make little arrows (easy to cut using scissors) and sanded them a bit so they were nice and smooth. I then turned over the knobs so I was using the flat (wrong) side. I inserted a screw with a dab of super glue so it would be stuck in place, and then super glued the arrows onto the screw and knob. I painted the whole thing with the metallic spray paint and enamel mentioned above. 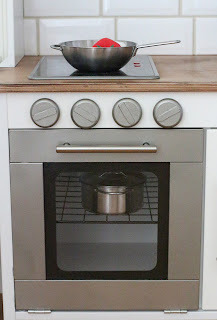 I drilled holes and put the knobs right above the oven using little nuts. I didn't tighten the nuts all the way so the knobs can move like real oven knobs. I also replaced the Ikea shelf with a metal oven rack using an extra piece of this shelving system that we had in the garage and some bolt cutters. Of course now that the oven looks like the real thing, it has to open like the real thing. I attached new hinges so it opens down instead of to the side. I found the perfect hinge solution here. I also added an oven light (he's got to be able to see if those cookies are rising!). The microwave has a turntable that really spins. It's made with a cd (painted with the same metallic paint and enamel). It has a metal washer super glued to the underside. It's attached with a bolt (also painted to match) that I cut really short with my bolt cutters. I drilled a shallow hole (NOT all the way through) and used gorilla glue to keep the bolt in place. So far it's holding strong and it's been getting plenty of use! I'm off to enjoy some play dough cookies! I've got one more post to come on the cosmetic details of the kid's kitchen remodel. It's entertaining and plausible at the same time how you accomplished this project! Seeing how you did everything for Carson's own kitchen, it's fantastic to think how much more house projects you can accomplish with such accuracy and expertise. Thank you for sharing this with us! I bet there are a lot other moms who would be so delighted at the idea that their little ones can have their own kitchens too! I found you last night when googling a hack for this kitchen. I'd love to email you with a few questions if you don't mind but I don't see an email address. I looked up the Rustoleum paint and it comes in a few silver colors - what did you use? No sanding first right? Just spray paint and then clear after to seal it? I have more questions - I hope we can connect! Oops! Sorry I just re-read your post and I do sand before painting the oven and MW doors. Hope to hear from you! Thanks! I used Rustoleum's Satin Nickel (from the good old Home Depot)! Hi! 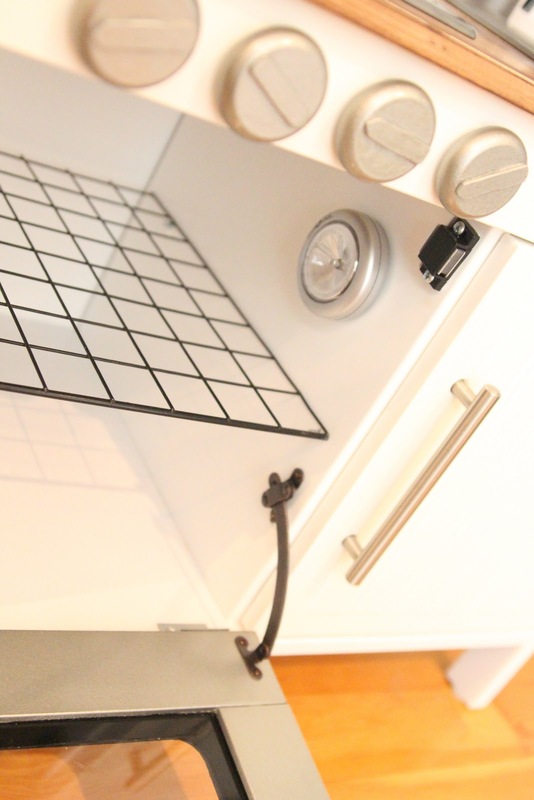 I am planning to do a few similar upgrades to the ikea mini kitchen but am wondering how you did the turntable in the microwave exactly and how does it turn if it is glued? I cut a bolt so it was very short (less the a half inch). I then very carefully drilled a hold where I wanted the center of the turntable being very cautious NOT to drill all the way through. I layered the spray painted cd on top of a metal washer and carefully glued the bolt into the hole I had partially drilled. I used gorilla glue and it's holding strong! Thanks so much for sharing your Duktig kitchen makeover! It's very sophisticated!!! I'm getting ready to start making over my daughter's kitchen borrowing off of your plan and I have a few questions. 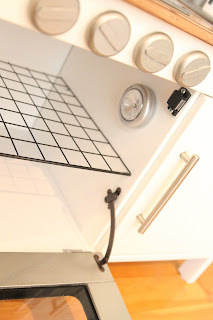 What size and kind of hinges did you use for the oven door? About how far from the edges did you place your hinges? Did you use Rustoleum Clear spray coat over top of the metallic (the link is broken)? How many coats of enamel did you need to do? I've never attempted any major task like this before so I'm a bit nervous about details ;) Thanks in advance. Best of luck! I'm sure your kitchen will turn out great and your daughter will be thrilled. However, in retrospect I might have preferred these: http://www.hardwaretree.com/proddetail.php?prod=S-259LRHD. The second set allows you to adjust the tension (so the door can't just flop open). Ours is actually holding up just fine, though, so you should be safe to go with the same set I used. You'll also need regular hinges at the bottom of the door. Something really simple from the home depot will do the trick (similar to this: http://www.homedepot.com/p/Everbilt-3-1-2-in-Satin-Nickel-Square-Corner-Door-Hinge-14982/202558075?N=5yc1vZc2ap but much smaller!) I placed the bottom hinges about an inch from each edge and with the other drop desk hinges you don't have much of a choice because the attach to the door and the kitchen frame. I did use a couple of coats of Rustoleum Clear Coat (it's a polyurethane) over the top for protection. I used 2 coats. Best of luck! Feel free to reach out with more questions! Hi. Above you mentioned the hinges you used for the bottom of the oven with the link to Home Depot but you said to use much smaller. Do you know what size to use? The one on the link is 3.5" but I can't seem to find much smaller than that anywhere. Thanks in advance! Love your kitchen makeover and am going to start ours! After attaching the bottom, corner hinges, did you give much consideration or measurement for the drop hinge placement? Mine came with no guide or documentation. Thanks to provide any insight as I have been struggling with this for a long time and now found a post that you used the corner hinges on the bottom- something I didn't earlier know. Thanks in advance! Thanks so much for answering my questions! I am in the process of painting right now. Unfortunately I'm not able to spray paint outdoors so I'm using foam rollers, brushes and low VOC paint to paint the individual pieces. Did you end up clear coating the white pieces of the kitchen before assembling them? I have heard some reports about white paint yellowing after using something like polyurethane and less so with polycrylic. Just wondering how both your white painted and metallic finishes are holding up on the Duktig. Thank you!!! I did not clear coat the white because I used super tough appliance spray paint. I only clear coated the "stainless steel" pieces. They are holding up great so far, no yellowing at all. However, I have definitely had trouble with polyurethane on white in the past. I wouldn't recommend it (or I'd definitely do your research and find something that claims to be non-yellowing). Good luck! Please let me know how it turns out! I did exactly as you guessed. It's holding up perfectly. I do LOVE chalk paint. I might be tempted to try that route. If you do, let me know how it goes! The chalk paint has adhered so well to EVERY surface that I've attempted. I would just test a patch first and remember that it will probably take a beating if you've got toddlers! The nice thing about the appliance paint is that it's pretty indestructible. Hi, I came across your blog via Pinterest. Have to say this is one of my favourite makeovers. A couple of questions though. Did you use primer before painting? And how did you paint the black rim for the oven/microwave look. Hi! This looks great, I am wondering how you painted the countertop? Did you sand and stain? If so, what kind of stain did you use? Any details you can give would be so appreciated!! Sorry about the delay, I was on vacation! Yes, I used some pretty rough sandpaper (80 grit), followed by some smooth sandpaper (220 grit), then I used minwax (early american) stain, followed by medium brown Briwax. Hi, what did you use for the beadboard? did you have to cut the wire rack to make it fit the oven? if so what are the measurements? could I also use a cooling rack? 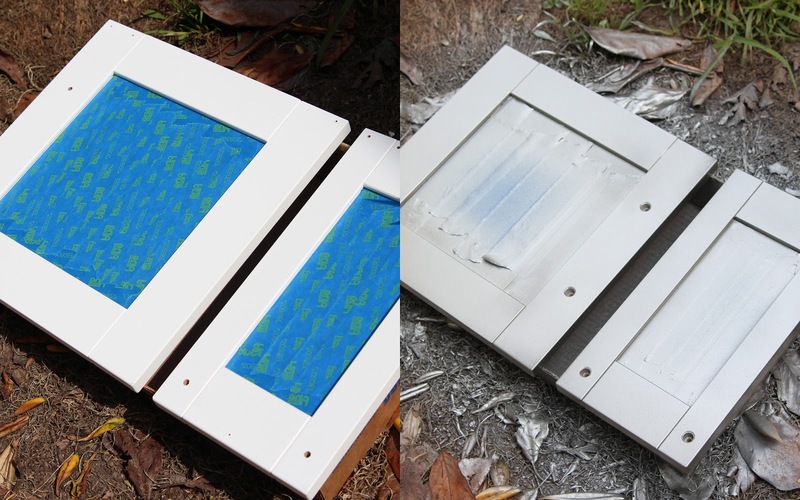 how did you apply the epoxy paint onto the windows of the oven and microwave. how did you get the shape evenly? can I get away with using a black sharpie marker? Great hack, I love it! Hi. Came across your ikea kitchen hack. 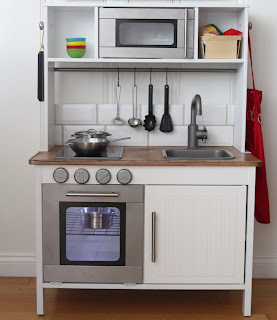 I really like the idea of the cabinet handle on the side. Could you share the details for this? Thanks in advance!